Bob Emmons and Gail Brock use Kitchen Spokane's commercial space to make B&G Sweet Heat Peppers. Maybe you've got an amazing recipe for salsa that friends rave about. Perhaps the gluten-free brownies you've been baking at home and selling at farmers markets have caught the attention of a local store. Do your thing, slap a label on it and wait for the money to roll in, right? Nope. Poor sanitation, improperly canned food, cross-contaminated allergens and other kitchen mishaps are all potential health hazards, meaning any scale of commercial food production is regulated according to what you're making and where you plan to sell it. Enter Kitchen Spokane, which actually operates four locations in the Inland Northwest: in Spokane at the NorthTown Mall, in Spokane Valley at 1014 N. Pines Rd., in Sandpoint at the Bonner County Mall and in Coeur d'Alene at Silverlake Mall. Spokane entrepreneur and former events promoter Jayme Cozzetto launched the nonprofit commercial kitchen venture in 2014. He likens the program to a gym rental: Pay for what you need, where you need it. Storage, for example, costs $3 per day for dry, refrigerated or frozen goods, or $5 daily for all three. Kitchen rental is $15 per hour, with a four-hour minimum per usage for customers on a six-month contract. Anyone can rent from the company, says Cozzetto, who describes how a large family once cooked their entire Thanksgiving meal at the facility, which offers an open drop-in rate of $22/hour with no minimum commitment. 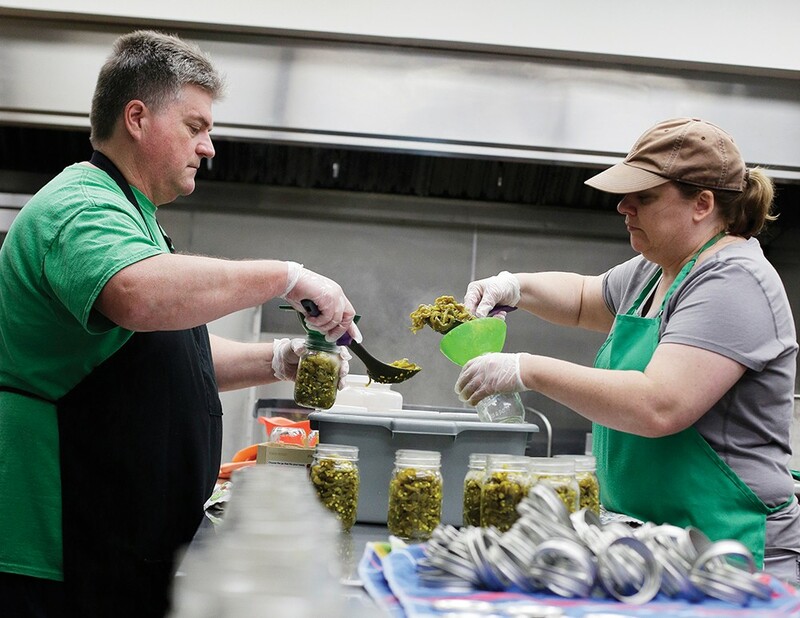 Bob Emmons and Gail Brock make and sell candied jalapenos. The couple started B&G Sweet Heat Peppers at their Spokane home in 2011, then went commercial in 2015. They now sell to Eggers Meats, Sonnenberg's Market & Deli and DeLeon Foods, as well as select grocery stores, farmers markets and local events. Getting a space in their home certified as a food warehouse for storage of completed products was fairly painless, says Bob Emmons, yet the couple decided to use Kitchen Spokane's commercial kitchen space in Spokane Valley for production, a decision that simplified the permitting process so they could focus on their own expertise: pickling peppers. "I don't consider myself a stupid person," notes Emmons, a mortgage broker who bristled at the bureaucracy of working with so many agencies to do what he saw as a simple food handling process. The U.S. Food and Drug Administration, which handles Washington's food processing plant license process, for example, rejected his application over a discrepancy in measuring their food labels, which had nothing to do with safely handling food. Having opened commercial kitchens in both Idaho and Washington, Kitchen Spokane owner Cozzetto knows better than most that each state takes a markedly different tack to food-based business requirements. Helping other startups navigate these complexities is a major driving force behind his venture. "We help food entrepreneurs jumpstart their business without the financial risk," he says. Find more about Kitchen Spokane's services and locations at kitchenspokane.org.